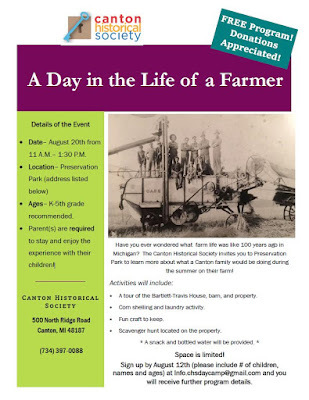 Come learn about what people were doing in Canton 100 years ago! A free, interactive program will be offered for families* with children K–5th grade on August 20, 2016 from 11:00 am–1:30 pm at Preservation Park. Space is limited, register today at info.chsdaycamp@gmail.com! *Please not that parent(s) are required to stay and enjoy the experience with their children.